What Works with Children, Adolescents, and Adults? What Works with Children, Adolescents, and Adults? 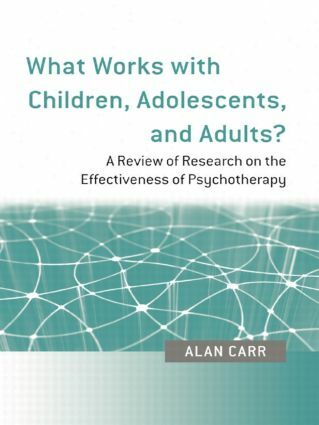 provides an up-to-date review of research on the effectiveness of psychotherapy and psychological interventions with children, adolescents, adults, people in later life, and people with intellectual and pervasive developmental disabilities. the effectiveness of specific psychotherapy protocols for particular problems. This comprehensive, user-friendly guide will inform clinical practice, service development and policy. It will be invaluable to psychotherapists, service managers, policymakers, and researchers. What Works with Children, Adolescents, and Adults? offers a review of the evidence base for three Handbooks published by Routledge: The Handbook of Child and Adolescent Clinical Psychology (Carr, 2006), The Handbook of Adult Clinical Psychology (Carr & McNulty, 2006), and The Handbook of Intellectual Disability and Clinical Psychology Practice (O’Reilly, Carr, Walsh, & McEvoy, 2007).